MS Outlook creates a default Outlook Address Book on the installation of the application. The address book combines all the folders of your Outlook Contacts. But, Outlook Address Book is not a typical physical address book, it is a virtual address book that only gives view to your Contacts folder instead of storing the Outlook Address Book as a separate file from your data store. For simplifying the usage of contacts folders in a mailbox, Outlook uses a personal address book. Your Personal Address Book (PAB) might contain contact information and e-mail addresses that are not available in your Outlook Address Book. However, Personal Address Book (PAB) creates a separate file on the hard disk drive of your computer, but it is recommended to check whether this address book is backed up. To confirm the backup of the address book, always include any file with PAB extension in your backup process. Now, click View or change existing directories or address books under Directory and hit Next. Copy or note path of PAB file as mentioned in the Path box. For instance: C:\Exchange\Mailbox.pab – this simply indicates that your file name mailbox.pab is stored in the Exchange folder on your C drive. Click OK and hit the Finish button. Please Note: You will need the path information as mentioned in Step 4 to find the PAB file to use it as backup or copy or transfer contacts to another computer. How to copy the PAB file to another computer? Step 1: Close all E-mail programs and launch Microsoft Windows Explorer. Step 2: Now, follow the path or expand folders as mentioned in Step 4 of Identify the PAB file used by your e-mail profile to locate the PAB file. Step 3: Now, copy the PAB file to the removable storage device, and use the storage drive to copy the PAB file to another computer. Also, keep a note of the path of the PAB file on another computer. Alternatively, if the source and destination computer are on the same network are on the same network, simply copy the PAB file from the source computer through network share on another computer. Please Note: You can save the PAB file in any folder on the destination computer if you remember the location. You can create a separate “Backup Contacts” PST file, if you have kept all the contacts in the Contacts folder and your preferred choice is to back up your contacts only. Firstly, add a new PST to Outlook and name it “Contacts Backup”. 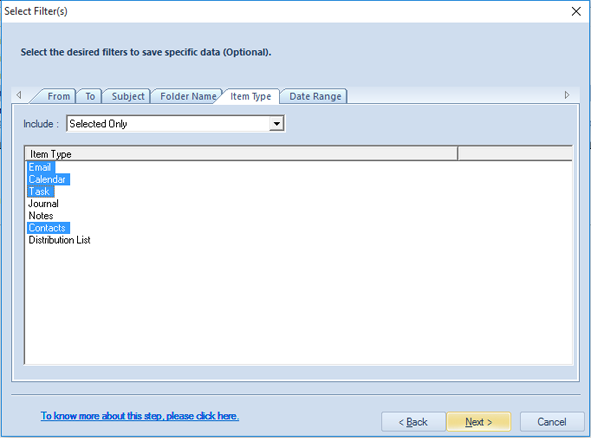 For Outlook 2007 and previous – File,>> New >> Outlook Data File. To open Contacts Navigation use keyboard shortcut – click CTRL+3. Now, right-click the Contacts folder which you want to backup and choose Copy Folder. Select the “Contacts Backup” folder from the dialog that pops-up, set and press OK. Note: Now, repeat Step 3 & 4 for all contact folders. Close Outlook and copy the new “Contacts Backup” PST file to your backup location. Have you lost Outlook contacts from your profile and looking for ways to recover them back? Then download the free evaluation version of Outlook PST Repair software to repair outlook PST files and recover contacts, calendars, emails, events, email properties, attachments, Unicode characters, images, deleted emails and every other personal folder of the Outlook PST file. You can also retrieve deleted emails from MS Outlook PST files with this perfect repair solution. Just for information, a GAL (Global Address List) and LDAP lists are located on connected mail servers or directory servers. Therefore, even if you forget to backup your address list, they are still available. These lists are always available and unaffected even if you reinstall your computer’s OS. You can simply reconnect to the server to access the address list.